Leather for every moment in life. Investing in the right bag is crucial, whether traveling for business, presenting in the boardroom, or escaping for the weekend. Our leather bag silhouettes are cleverly constructed to organize you for work and life, all while maintaining an effortless, sophisticated style. Classic doesn’t have to feel common. The timeless silhouettes in our men's collections are reinvigorated in full-grain pebble and smooth leathers. Each bag is thoughtfully designed to be as versatile in functionality as they are in style. Fall in love with leather! Equal parts fashion and function, our ladies’ silhouettes are crafted using Saffiano, Pebbled, and Smooth leathers. 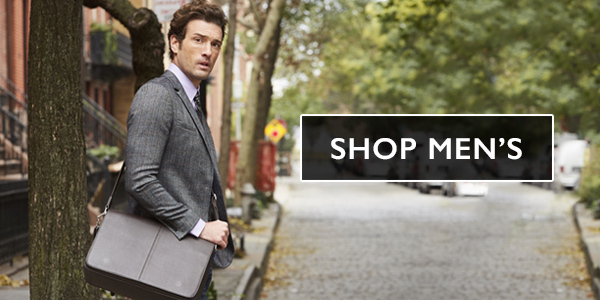 Thoughtfully designed for a seamless work-to-weekend transition, these bags will carry you in style.